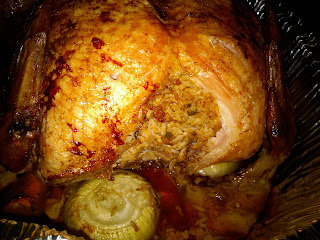 Hungry Kat: Turducken At Last! 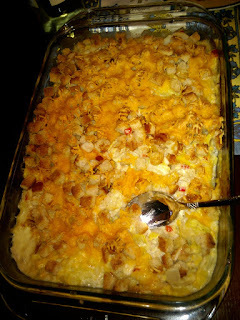 My friend Becky invited me and a bunch of friends to her house for Turducken and a good ol' Southern feast of country ham biscuits, squash casserole and mashed potatoes. Hot butter rum warmed us up as soon as we arrived. Wow, I didn't know you could combine butter with rum. Really, how could I (we) live without butter? Unthinkable! And how could I ever live without wonderful friends who know I'm hungry and would indulge my taste buds?Impossible! I'd like to use this post to give thanks to my family and friends and everyone who made 2009 fun and tasty for me and I'm looking forward to more good times in 2010. I'm sure 2010 will be even more fantastic! Happy New Year! Becky cooked this for about 4 hours. It's stuffed with delicious Jambalaya Rice. 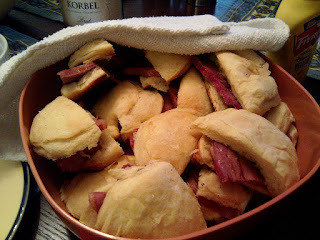 Becky served these babies as appetizers; they were soooooooooooo good. The biscuits were warm and fluffy. The ham was a perfect balance of salt and a bit of fattiness and it was real meat - not the over-processed "franken-ham" you normally find at the supermarket. Becky ordered the ham from Loveless Cafe in Tennessee. I just placed my order...yeah, I don't waste time. Carving time. Becky also scooped out all the Jambalaya Rice which we devoured completely. 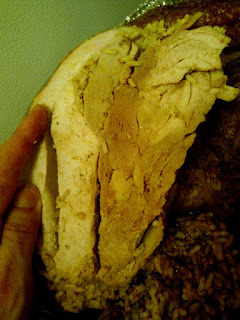 The layers of chicken, duck and turkey looks like stratas of ancient sedimentary rock. Beautiful isn't it? And it was tasty too! 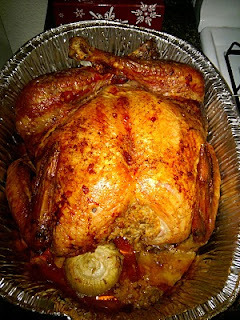 All the layers of meat were well-seasoned and the chicken and duck was good but the nicest surprise was the turkey. I usually don't like roast turkey because it's bland and dry but this turkey was moist and super flavorful. 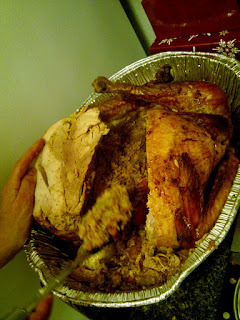 The most awesome and fun part was eating the giant turkey wing too...hehe. Becky made this with squash obviously and generous amounts of butter, cheese and bread topping. I get the feeling that a good ol' Southern meal cannot be without butter, cheese and meat. Nice. 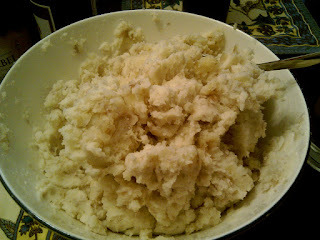 We forgot to put gravy on the mashed potatoes and we didn't even miss the gravy because the potatoes were so good with milk and butter mixed in. 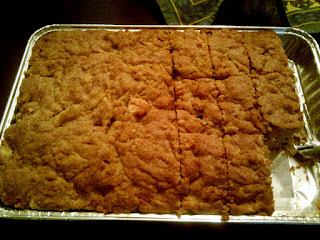 Another friend, Coolia, made Apple Cake with her mother's recipe. This light, fluffy cake was a perfect ending to our sumptuous meal. It wasn't too sweet and there were nice bits of apple in it.